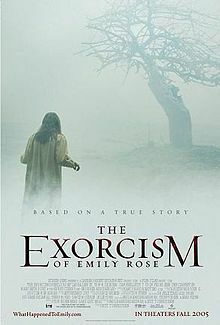 The Exorcism of Emily Rose is one of my favorite movies, particularly in terms of possession movies. A reason for this is the exorcism is always put into doubt in this film. The combination of supernatural and rational thought makes for a film that is, I believe, thought-provoking for all but the firmest believers of either science or the supernatural. The film is loosely based on an actual case, that of Anneliese Michel–a German woman who underwent an exorcism and later died. The film is a dramatization of Michel, her exorcism, and the trial later held. What I find interesting about this film is the juxtaposition of evidence of possession with countering evidence that Emily Rose, as she’s called in the film, is actually mentally ill. Was she mentally ill or was she possessed? It’s up for the viewer to decide, but I would say that the movie does lean toward possession. I think this is shown by the film’s representation of the characters: the pious nature of the parents and religious figures, and the almost antagonistic behaviors of the prosecution. The prosecution is doing their job, so I don’t hold anything against them, and most people may believe they are right in real life, but when watching a film, the tendency to rationalize everything may not be there in the way it would be in life. What makes this a horror film instead of just a courtroom drama is how this movie portrays the events as real life. For many people, the possession of Emily Rose–whether she’s possessed by a demon or a mental illness–can happen to any of us without becoming aware beforehand. Something is wrong with Rose, that much is certain and uncontested in the film, and whether or not you believe in the supernatural, something like this can be inflicted on a person and change the person’s life for the worst. Mental illness is real, many people suffer from it obviously, so one day you can be walking your dog, waving to a friend, and just as you are about to take a drink of your venti cafe latte, boom, something is wrong, you’re paralyzed, or you’ve entered into an episode of epilepsy, or whatever else that can happen suddenly. Sometimes a person never experienced effects until they are older, or the effects were so subtle they almost went unnoticed. For Emily Rose, the suddenness of her mental illness, if that’s what you believe affected her, prompted the theory she might have been possessed. Without warning, if you were afflicted, would you believe it’s medical or supernatural? For me, I would lean medical, but I’m also not the most religious person; if I were, who knows what I would think. Either way, what makes this movie horror is that something can happen to us that we can’t immediately explain, much like Emily Rose, and it doesn’t matter what is causing it, it can kill you. I liked the concept of the story, and I think the conflict of science versus religion is vastly interesting. I had lots of quibbles with some of the story choices, but overall I found the movie spooky and thought-provoking. I was raised Catholic even though I’m religious now, and it hit a lot of my inherent fears left over from being raised in the church, which informs how scary I found it. But when I step back and look at the situation with my cynical agnostic eyes, it’s hard not to fall on the side of science and wonder what sort of horrible things have happened to ill people in the name of religion.